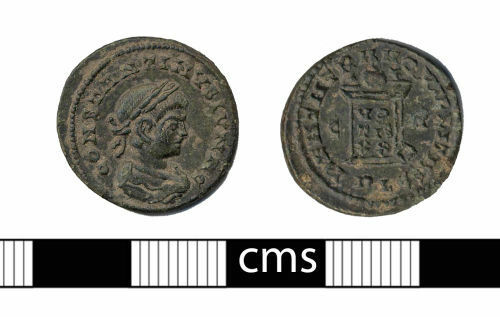 A copper alloy Roman nummus (AE3) of Constantine II as Caesar ,dating to the period AD 318-324. Reece period 16. BEATA TRANQVILLIATS reverse type, mint of Lyon. Roman copper alloy nummus of Constantine I ,dating to the period AD 318-324. Reece period 16. BEATA TRANQVILLIATS reverse type.